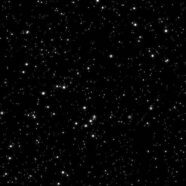 Home » News » Could you be an astronaut? 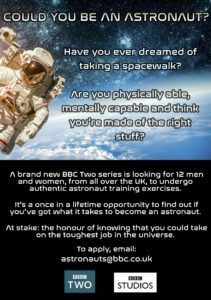 A brand new BBC Two series is looking for 12 men and women, from all over the UK, to undergo authentic astronaut training exercises. Over a 28 day period in spring next year, participants will tackle authentic exercises, normally achieved by only a select few. From taking a spin in a human centrifuge to experiencing zero gravity, trainees will be evaluated by a team of expert assessors. They will be pushed both physically and mentally to see if they have what it takes for this once in a lifetime opportunity. More details can be found on the programme website, or see the flyer below. Participants will need to be aged over 21, physically fit and resident in the UK.